This morning at an event for the media, General Motors announced its next-generation V8 small block engine range that will first debut in the C7 Chevy Corvette. As we reported yesterday, the first mill of the new LT range — the LT1, is 6.2 liters in displacement and makes a preliminary 450 horsepower and 450 lb.-ft. of torque. We expect those numbers to rise. The LT1 sports an astonishing 11.5:1 compression ratio thanks to direct injection, features active cylinder deactivation, 2 valves per cylinder, and a 6,600 RPM fuel cutoff. It’s expected to achieve more than 26 MPG and weighs in at 465 lbs (211 kg). Production will take place at GM’s Tonawanda engine plant in New York. Expect a deep dive into the new mill later today. LT1? I guess it’s OK to use that again? (1970,1992 Corvettes had new LT1 small blocks). Of course the big question for the enthusiast who does’nt want or can’t afford a Corvette, Camaro, CTS-V or full size GM pick-up/SUV is: How much is the 2014 SS sedan going to cost with one of these new LT motors? I’m guessing $42-45K. Considering you can buy a Camaro 1SS for $39,500 before GM credits coming off (here in Canada), I can’t see the the 2014 Chevrolet SS starting around $42,000. I’m guessing it will start around $36,000 to $38,000. car, no where close in volume to the Camaro. Which version was posted before? 1. Not sure if you read the entire piece, but the information (story) was breaking news as of the morning of publication. We were the first to have this up that day as we were attending a GM press briefing and wrote this piece from the briefing itself. The specifications of the engine, including its power numbers, displacement, fuel economy, and other specifications have not been available until now. 2. The photo we initially used was one released by GM this summer, as we simply couldn’t use the photos of the LT1 we snapped at the event itself. Since then, this has been updated. What about putting this on the camaro??? Will it get heavier?? I don’t understand why they resurrected the LT1 name. Why not name it with the LS series?? It’s not a reserection of names, rather, GM’s RPO code nomenculture. These are three hypens that can repesent either a letter from A to Z or a number from 0 to 9. That’s 18576 different RPO codes. As a rule of thumb, if an RPO code begins with an “L”, it’s an engine. GM can reuse codes, as they have done here with the GenV. This LT1 shares absoulutely nothing with the Gen2 block; only it’s name. It’s possible GM could have called the GenV the LK series or LU or anything else begining with “L”. Considering the last Gen2 block to have an LT RPO code was in 1997, I doubt many people are going to be confused by the new name. How many millions of dollars does it take to get an extra 14 horsepower? So I can go order a Silverado LT1 with an LT1?…..but not a Camaro LT1 with an LT1?………this is too damn confusing. I agree with Mike, they should have named it something else. To clarify, the 6.2L LT1 engine is the RPO code that will be used for the base Corvette V8 (confirmed) and the refreshed Camaro (expected). We do not yet know exactly what sort of differences we will see with the new Silverado/Sierra V8 engines, or what they will be called — but expect direct injection and the new combustion system. It has active cylinder deactivation previously called active fuel management. Which was the new name for displacement on demand. Just like the L 99 engine. So it is actually 50 hp increase. So Silverado 2500 replacement engine. That is a mill badly in need of being taught about MPG. More doesn’t always equal better. The valve intakes are larger this time around, and other changes we are working on publishing in a very digestible manner for all of us to understand. They really laid it on thick this morning. After asking the same question you just did, it was best described to me as this: what’s better, two 2cm holes, or four 1/2cm holes? My question to Jordan would surround the purpose of an overhead cam design. Simply having the layout/setup doesn’t make it better, more powerful, or in any other way more beneficial. In fact, a DOHC setup increases the engine’s proportions and weight, while improving power slightly… not to mention adding complexity which usually leads to inferior reliability. To Manoli: I suppose when you put it that way, the actual area of valve openings is a better metric than the number of openings. Although I would think (and I think some basic geometry could suggest), that more area could be achieved over that piston by using more (albeit smaller) openings. To Alex. I’m far from being an expert or anything, but could it be argued that overhead cams would actually simplify the engine (fewer moving parts)? Also, a DOHC could allow for VVT, which could provide a noteworthy boost in fuel economy and power. Correct my if (or where) I’m wrong? And I understand that the “Chevy pushrod smallblock” has been set the standard for power, simplicity, and reliability…I just have an increasingly hard time believing that with the new generation we are still using the same tech. In term of fluid dynamics, air (or any fluid) flows at a higher velocity in a larger diameter chamber due to less friction. Friction is highest through a pipe/ chamber at the sides/walls and gets faster and faster as you move towards the centre of the pipe. Now that is just a basic principle, once you start looking at geometry and valve timing, etc, things change. Agreed. I’ve studied fluid dynamics myself (engineering school), and now that you bring it up, I would agree that even though two circular valves wouldn’t use up as much available real estate in the head, equal or higher discharge could be achieved than that of multiple valve openings. Also, and I don’t know if this have ever been done or is even possible, but do we know if the two valves are even circular? Non-circular valves could open up some possiblities as well. This may be a stupid question, but does anyone know if VVT has been/can be done with a pushrod design? I suppose I should have just thought about the 2-valve, 4 valve thing a little more from an engineering standpoint rather than just let myself be convinced that 4 valves is automatically better. My bad! 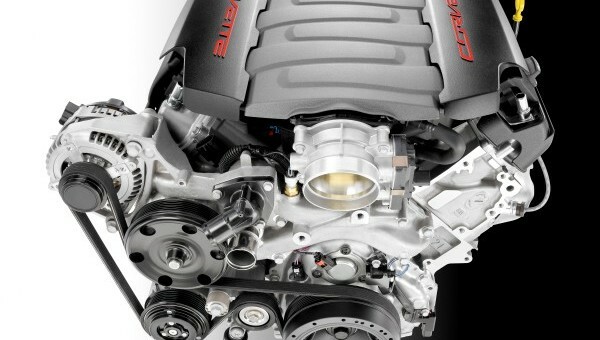 The LT1 will have VVT it has an range of 62 degrees. VVT is currently used on GM engines 6.2L with auto trans in the camaro. And 4.8. 5.3. 6.0 6.2 in trucks and suv. Another thing not mentioned about CIB vs. DOHC is the aftermarket for performance mods. The DOHC design is not nearly as established in this area. Who wants to buy four cams or spend the extra time and $ to have their 4 valve per cylinder heads ported? Not everyone goes to those lengths for performance improvements, but the market is out there and it’s not insignificant. I am not happy with 450 bhp and 450 lb-ft I was looking foward to more like 525 bhp and 490 lb-ft.
525hp in a base Corvette engine? Hear of the Z06, that’s what you’re aiming at. Power isn’t everything, in fact it’s secondary. The C7 is going to be lighter, better handling, better suspension, and easy to say shorter stopping distance. This engine is good for more power, tons more. And for the average person going and buying a Vette, do you know how much more liveable a 450hp car is over a 525hp car? Especially when it’s probably going to have a curb weight at 3200lbs. There needs to be a hierarchy. This is the base, that’s how it is and how it should be. You’re forgetting that the base Corvette is promised to deliver a sub-four-second 0-60 time. That’s Z06 territory, and we’re not even talking next Z06 yet. Also, we smell that these numbers are currently under-rated. In all fairness, GM could only have used a DOHC setup for 2 reasons. One would be slightly better airflow, and the second would be higher RPMs. GM probably wasnt looking for a 9000 rpm screaming engine in the first place, so that is ruled out. In the trade-off for slightly (read: slightly) better airflow, GM gets a lower center of gravity, a more robust and reliable system, and lighter weight. Unless GM wanted a direct Ferrari fighting engine (high RPMs), pushrod is the way to go. Please note, I do not wish to say the Corvette will be worse than a Ferrari. It will most likely be better. I am simply saying that Chevy and Ferrari have different ways of accomplishing a similar goal, for now at least. I dont see a power steering pump among the accessories… so I’m going to venture a guess and say that the C7 will come standard with electric power steering? Don’t forget that DOHC engines are a good bit taller to make room for the added mechanicals sitting up top. I think GM wants to keep a low profile hood so it will fit nicely in a wider variety of vehicles rather than just trucks.